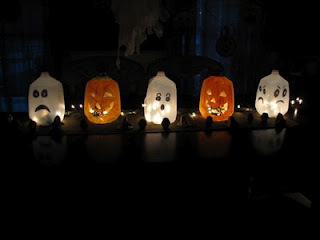 I had no idea how many super cool crafts are out there for Halloween using Milk Jugs. There are just so many…. and they all are just so cool. I was searching the internet for some awesomely creepy Halloween crafts and I found some doozies for you. In this post I have listed 15 spooky Halloween crafts using Milk Jugs. What’s so wonderful about these Halloween crafts is that they all use milk jugs…. an item that most of us use every day. So, you are sure to at least have the most important material for these crafts. Scroll through all 15 of these Halloween milk jug crafts to find some to do with your kids at home. They will love it. Check out this spider. It’s super awesome and super big…. I love it!! It will be a wonderful Halloween Decoration this Season. It is sure to creep out all who see it. 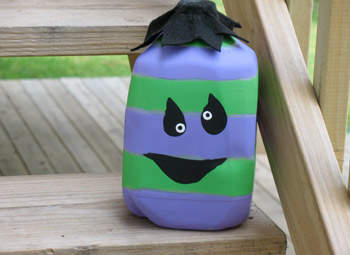 Check out Family Fun to get all the details on this great Halloween Milk Jug Craft. I don’t know about you, but I’m always looking for a unique way to show off my Halloween spirit with a great centerpiece. Well, folks I think I found it. Check out this awesome Halloween Table Centerpiece. I found it over at The Ramblings of a Crazy Woman and I absolutely dig it!! I have a great Halloween Craft for you to use up those extra Milk Jugs you have along with some old Christmas Lights. Eighteen25 shows us in great detail how to make this amazing looking outside decoration. By simply decorating a bunch of milk jugs into ghosts you can have a cheap and fun way to decorate the house this Halloween Season. Every Halloween I look for original ways for the kids to carry their candy. 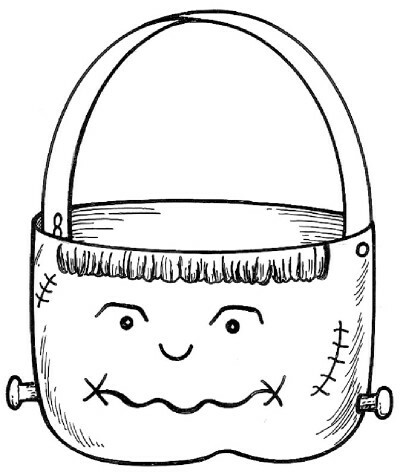 How about making a unique Trick-or-Treat Basket using a Milk Jug. I found this great Milk Jug Halloween Craft over at TLC Family. What is great about using a Milk Jug for this craft is that the Trick-or-Treat Basket will not only be sturdy, but it will be rain proof too. 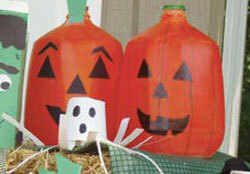 Here is another fantastic way to use a Milk Jug to make an outside Halloween Decoration. Here Thrifty Fun shows you how to take a milk jug along with some plastic garbage bags and make a terrific windsock. The ghost will actually look like he is flying through the night. This has got to be one of the most creative ways to use a milk jug for Halloween. 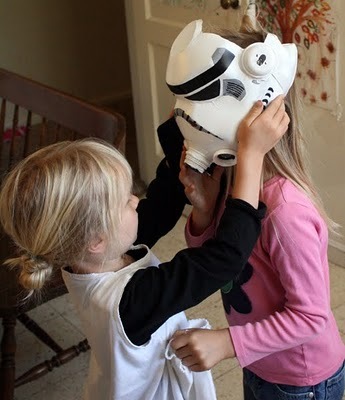 Filth Wizardry shows us step-by-step how to take an everyday milk jug and make it into a storm trooper helmet perfect for dressing up this Halloween. Any child will not only love making the craft, but using it to dress up too. Here is a wonderfully colorful way to decorate the outside for Halloween. 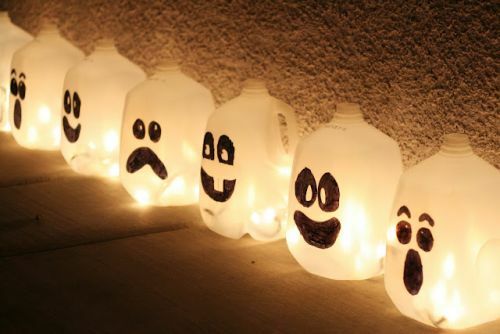 Take milk jugs and transform them into Monster Yard Lights. This is a fun way to decorate your yard or walkway and the kids will absolutely love it. Do you know what they will love even more? Making them with you. Check out Crafts by Amanda for all the craft details. If you are tired of decorating your usual pumpkins…. why not try something a little bit different this year. Kiwi shows us how to take a milk jug and decorate it into a pumpkin. Let the kids decorate whatever way they want to come up with unusual and unique pumpkins. 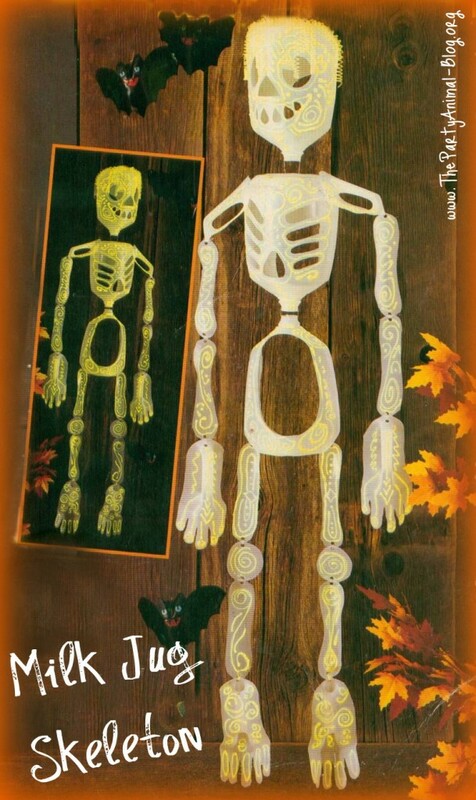 They will become great Halloween decorations and you will create loving memories of the time you made these together. 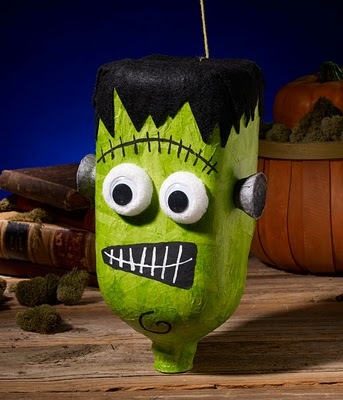 If you are having a Halloween Party this year this is an excellent Halloween craft for you. 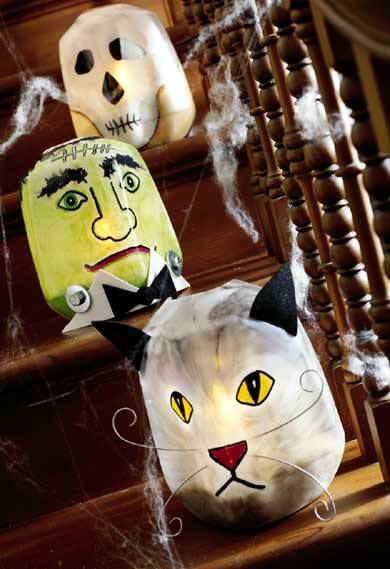 You can make this creepy looking Halloween Pinata with the help of Cathie Filian. Here she describes in great detail how you too can make this one of a kind scary pinata for your next Halloween party. Why not take those extra milk jugs you have and make them into Halloween Masks. 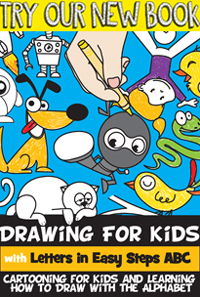 Your kids can be as creative as they would like to. 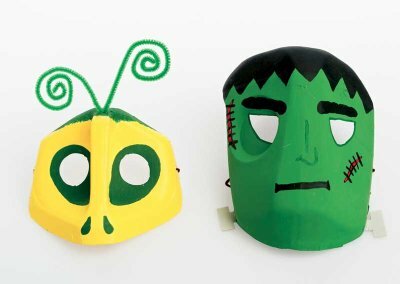 These Halloween masks are as much fun to make as they are to wear. Check out TLC Family for all the how-to’s to make this craft. 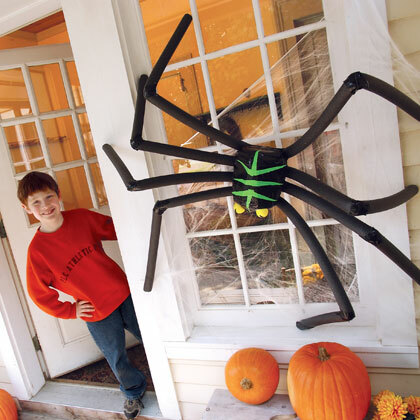 Here is a great Halloween Decoration….. perfect for inside your house. 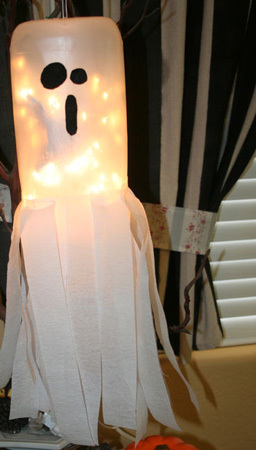 Because this craft is made with Christmas lights the ghost actually lights up. Turn off the lights and check out how your Ghost will actually glow. Spooky, right? Sure is. Get all the craft details at She Knows. This friendly little monster is not only cute during the day, but also lights up the night! Not everything about Halloween has to be scary or spooky. Some little ones just can’t handle too much scary. For these little ones this Halloween Milk Jug craft is perfect. Check out Kaboose for all the details on this craft. 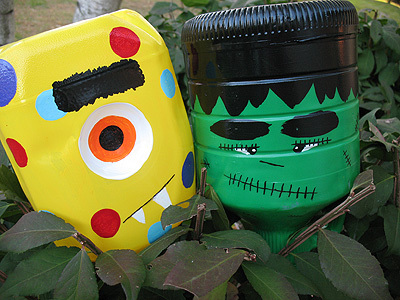 This Halloween Milk Jug Craft is so creative!! And, it looks like an incredibly fun craft for the kids as well as the adults. I found this craft over at The Party Animal and I just love it!! You will need plenty of Milk Jugs for this craft…. 7 to be exact. But, if your kids drink a lot of milk like my kids… you will have the 7 milk jugs in no time. I found this creative Halloween craft over at Ladies Home Journal. In this post they show you how to take Milk Jugs and make them into Skeletons, Frankensteins and Cats. 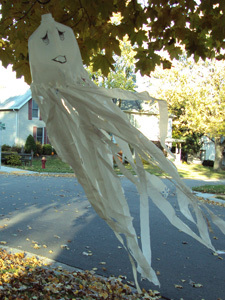 Line a bunch of these down your driveway or a path to make a spooky lit area for the trick-or-treaters to walk. We just put up our very own Halloween Milk Jug Craft. 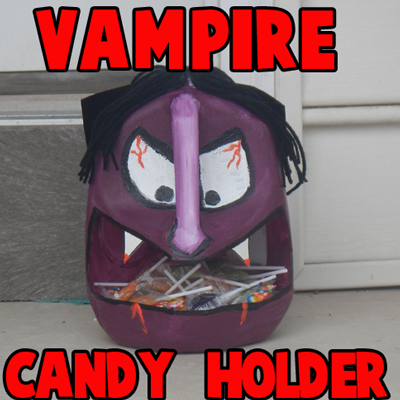 We made a Milk Jug Vampire Candy Holder and it’s perfect for Trick-or-Treat night. You can actually put tons of candy in the mouth and let the Trick-or-Treaters reach in the Vampire’s mouth and take the candy. They are sure to get a big kick out of this. You’re welcome!! Thanks for having such a neat project!